Mount Pleasant is a residential neighborhood located in the northwest quadrant of Washington, DC. The neighborhood initially developed as a streetcar suburb and bedroom community for government workers before evolving into an urban enclave that has become a haven for the District's Latin community. Historic Mount Pleasant is also home to the first African American place of worship on 16th Street. Tree-lined streets serve as a backdrop for a mix of stately Victorians, apartment and condo buildings, 20th century row houses and Colonial revival mansions. Several of the larger houses have been converted into condos. A walkable community, Mount Pleasant is conveniently located near the National Zoo and Rock Creek Park. A smattering of local businesses, including coffee shops and small eateries catering to the Central and South American clientele make-up many of the shops on Mount Pleasant Street. Mount Pleasant is bounded by 16th Street to the east, Rock Creek Park to the west and the north and Harvard Street to the south. 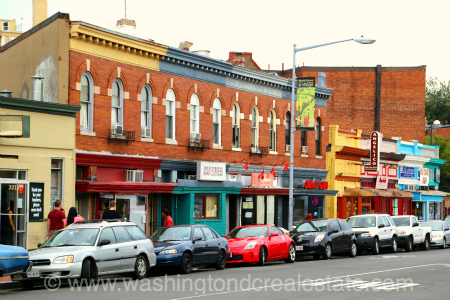 Adjacent neighborhoods include Adams Morgan to the south and Columbia Heights to the east. Mount Pleasant is two blocks from the Columbia Heights Metro station.